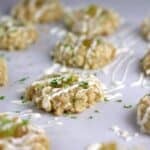 Sweet pineapple, macadamia nuts, and lime highlight this new spin on the classic thumbprint cookie. If your holiday season is marked with batches and batches of cookies, Tropical Thumbprint Cookies is a perfect new recipe to add to your cookie line-up. This post is sponsored.